Photos: Top Left- Least Tern feeding her young on the sand. Top Right- A couple birding ladies enjoying their day at the Bolsa Chica Wetlands. All I heard was a roar of birds when I opened my car door! I visited the Wetlands in July during nesting season. What a treat! There is a wooden bridge from the parking area to the walking pathways along the water inlets. The bridge is right at flight height so as you walk across the bridge, birds soar above your head or at eye level. It is amazing! 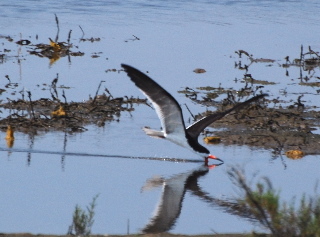 The Black Skimmers, with their up to 44" wing spans, are delightful to watch as they skim the water for minnows. 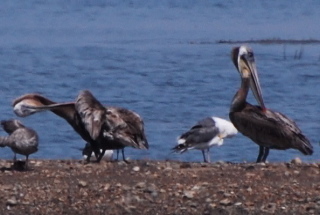 There is every type of waterbird, wading bird, and or shorebirds you can imagine. Due to it being nesting season, we were able to see the Least Terns feeding their young on the sand in the open. 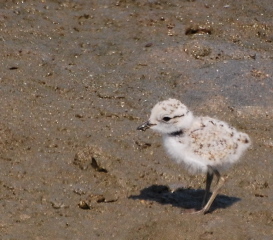 The Least Tern chicks were the cutest ever! You couldn't help but ooh and ahh as you watched the fuzzy little Terns run around in the sand. I'm looking forward to visiting at a different time of the year and see what birding surprises await me. 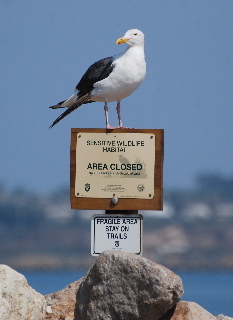 The Bolsa Chica Wetlands is a must see for any birders living in or visiting Southern California. Mystery bird. Let me know what you think it is.